The weather is slowly turning and we’re counting down the days to warmth, blossoms and outdoor experiences. In the meantime, as days grow milder, Boston becomes inundated with events and festivals that celebrate the beginning of spring. These are just some of the ways you can make the most of your visit in April. 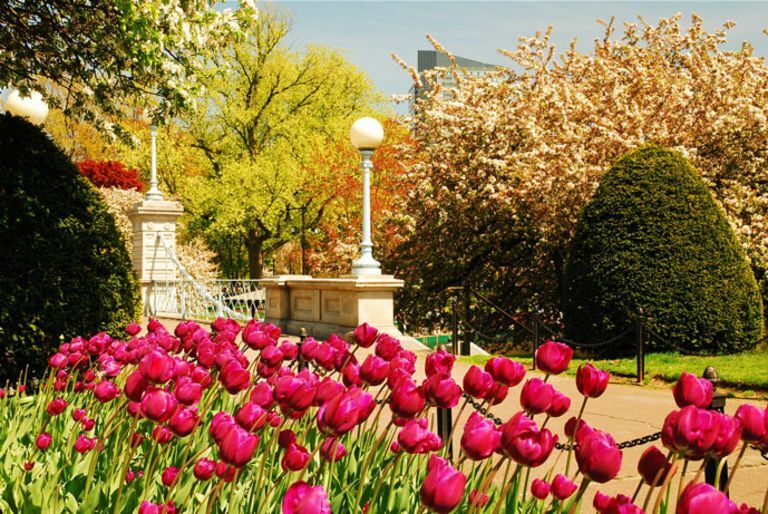 Established in 1837, Boston Public Garden was the very first botanical garden in the United States. While this is an attraction worth visiting year round, spring is the best time to admire its dozens of unusual plants, the Lagoon, the monuments and fountains. If you want to follow an old tradition, glide across the lagoon on the iconic Swan Boats, which open for the season on April 13, 2019. For 12 days, Boston will roll out the red carpet for the most innovative, creative and diverse Design Week yet. The 6th year of the Boston Design Week will include programs, exhibits and events that aim to spark an interest in and emphasize the importance of design in our lives. Whether you’re interested in graphic design, fashion, interior design, technical design, historic preservation or architecture, this event caters to everyone! For one day only, experience the best of South Boston’s restaurants at the Annual Taste of South Boston. This festival will be celerbating its 17th year and it’s been around that long for a reason. Apart from bringing together the culinary community of chefs and gourmands, it’s a place to socialize, sample exquisite food, wine and beer. The festival includes live entertainment, a silent auction and raffles. Race Course: Start at Hopkinton Center and Finish Line at Boylston Street near Copley Square. Regarded as one of the best and most challenging marathons in the world, the Boston marathon is the main running event in New England. It also represents the opportunity to marvel at the speed of elite athletes and cheer on amateur and avid runners from all over the world. Japanese culture is commonly associated with spring mainly due to the popularity of cherry blossoms. Japan Festival Boston is taking advantage of this by organizing an annual cultural festival that celebrates traditional and contemporary Japanese culture. Expect authentic food vendors, performances, music, workshops and cosplay contests. This year’s theme is Kyoto, the sister city of Boston, and admission is free. Even if the sunny spring days aren’t here yet, we know of a place where you’ll always find colors. You guessed it, Studio Allston! Consult our hotel offers and book your room in the most creative hotel in Boston.